The biggest fall-out of the digital revolution is arguably the decline of the human attention span. According to a study by Microsoft, it has been found that people generally lose their concentration after 8 seconds which is lower than that of a goldfish (9 seconds). If you are an online business in today's landscape, the above statistic is critically significant for you. As the modern user visits your website, you've got to impress them and you've got to do it quick! 47% of consumers today expect a webpage to load in two seconds or less. What's more, just 1 second of delay in response time can lead to 7% reduction in conversions. Not just the customer experience, your website's speed also affects its performance on search engines. 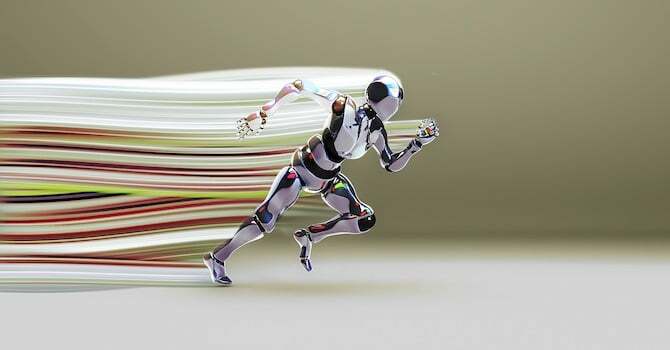 Google has clearly said that website's speed is one of the signals used by its algorithms to rank pages. With slower websites, the search engine is able to crawl less pages on your website which can negatively impact your indexation. WordPress powers more than 31 percent of the entire World Wide Web. If you are one of these websites, you have a lot of competition. With so many choices for an average internet user, you need to make sure that your website is fast and provides a great user experience. Reducing cookie size, removing duplicate scripts and optimizing images are some of the ways you can speed up your WordPress website. 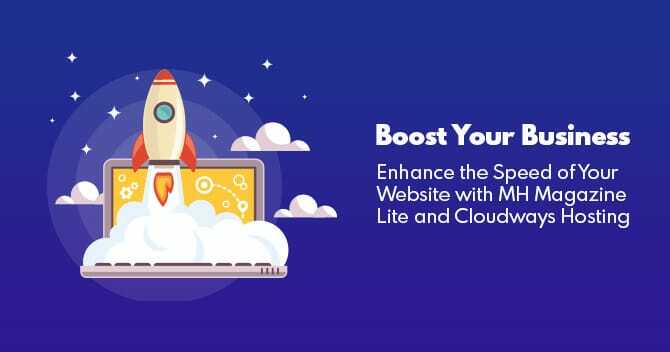 However, two of the most critical factors that make your website faster are: Lightweight WordPress themes and a reliable WordPress hosting provider. 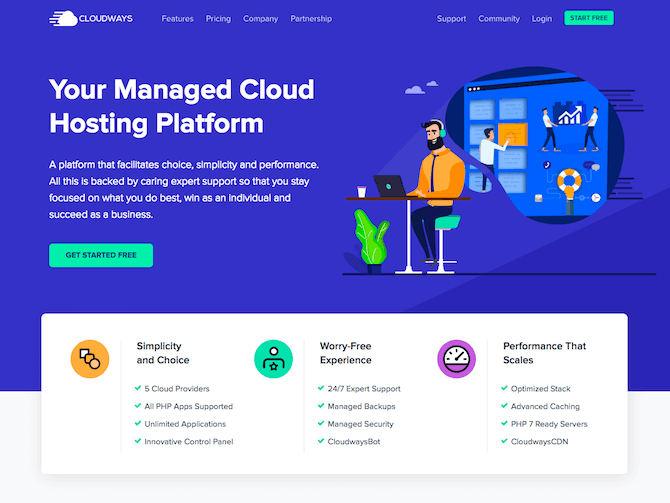 We at MH Themes decided to test one of our WordPress themes with Cloudways – a WordPress managed hosting platform. Let's get started with this Cloudways review with information about the company. Let's get down to business and test the performance! They have more than 60 data centers across the globe. This helps a great deal in reducing latency. 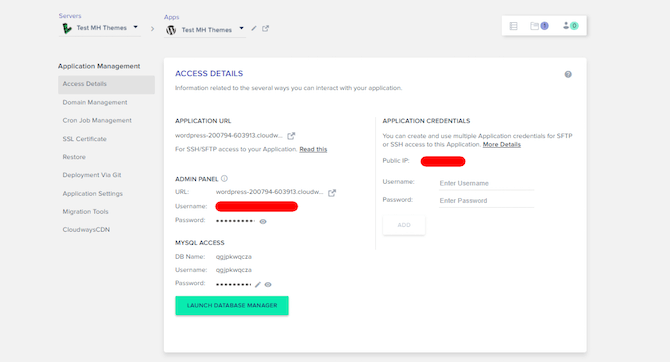 First up, you need to set up an account with Cloudways. Visit the Cloudways website, navigate to the sign up page and provide your details. After you have created an account, log in. Click “Launch Now” button at the bottom to launch the server. It will take a few minutes to launch. After the creation of your server, you will receive a temporary staging URL to test your WordPress website. You can get the URL from the Applications tab at the top. After you have carried out testing, you can transfer the domain and get your WordPress website live. 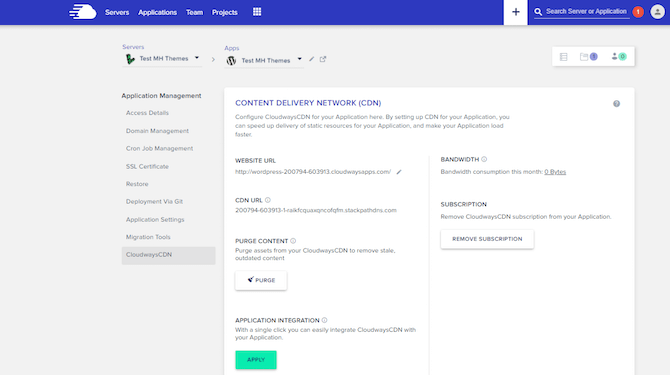 In the screenshot above you can see how the Application Management screen looks like. Although Cloudways has a team of professionals who provide 24/7 customer support, they also provide users with control over their servers. You can easily access it from the “Servers” tab at the top-left and make any changes that you want. Now that you have set up an account with Cloudways and have launched the application, let's compare the default WordPress theme with one of our free WordPress themes. The idea is to show how fast WordPress hosting combined with a lightweight theme can significantly enhance the performance of your website. Let's proceed this Cloudways review and first test the speed of your website with a WordPress default theme. Pingdom is one of the most reliable website speed testing tools around. Enter the URL of your website and select the nearest location to test. In our case, that would be San Jose, California. With the default Twenty Seventeen theme, you get a performance grade of B and a score of 89. On average, it will take 550 ms for the page to show up on the users' screens. 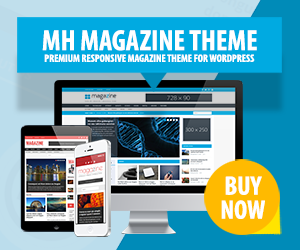 MH Magazine lite is one of the most popular free responsive themes used for news websites, professional blogs and other editorial websites. It is fast, secure and SEO-friendly. It is apt for websites that cover topics such as politics, fashion, travel, sports, international news and so on. As you can see, there's a clear improvement in your website's performance by just changing the theme and keeping everything else constant. The performance grade has improved to A with a score of 90. The page load time has also decreased to 468 ms. Surely you have noticed the website speed gains after activating MH Magazine lite. Having said that, there is always room for further improvement. 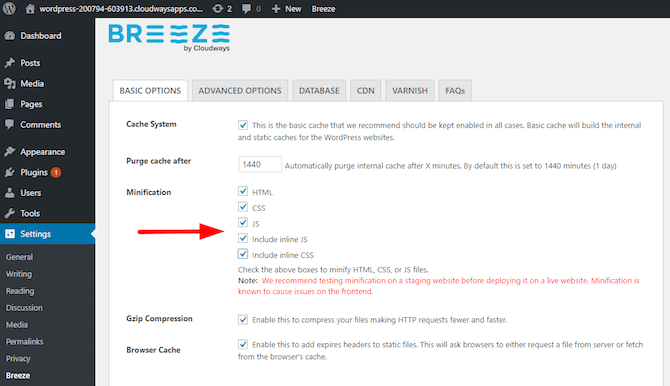 Cloudways offers a WordPress cache plugin called Breeze to enhance website's performance and help you avoid dealing with complex cache plugins. With just a few clicks, you can make your website faster than before. Also, be sure to group CSS and JS files into a single file in the “Advanced Options” tab and finally “Save Changes”. With minor tweaks in Breeze, the performance score improves to 96. Page load time has significantly reduced to 178 ms. There is a query string warning on “Font Awesome” and “Open Sans”. Since they are default fonts of the theme, we have kept them enabled. Since we are on the topic of enhanced website performance, it is important to mention CloudwaysCDN. As the name suggests, it has something to do with content delivery. What happens is that the CDN makes a copy of your website and stores it in multiple servers located across the globe. This allows your global audience to get quick access to your content. Let's say you live in the UK and have chosen Cloudways' London data center. Your WordPress website will host here. Your users' requests will also be taken care from here. For your users located in Europe, your website will perform fine. However, for users accessing your website from Tokyo, which is quite far away from London, your website's speed will impact negatively. This is where CDN comes in handy. With cached copies in multiple servers across the world, it quickly fetches content and delivers it to the user. 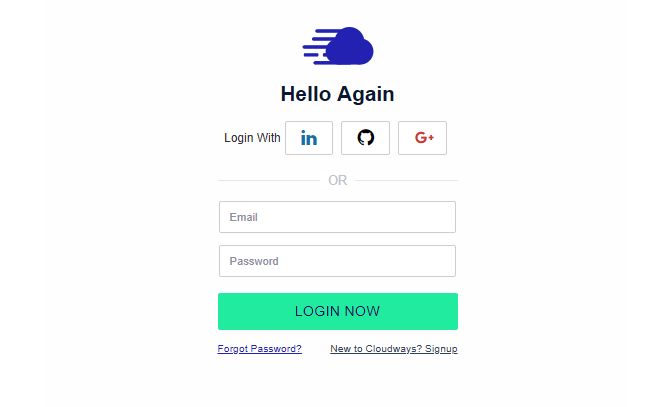 Let's move on with the Cloudways review and discuss how you can integrate CloudwaysCDN in your website. 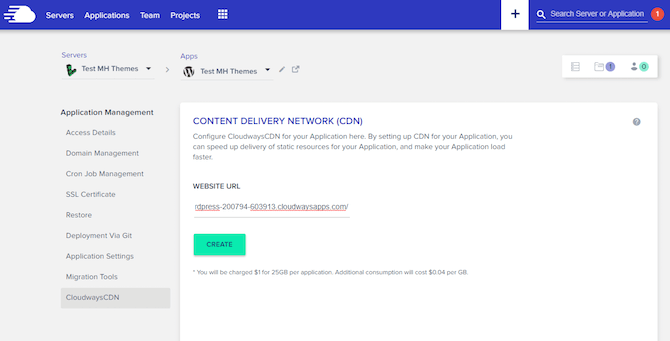 From the Applications tab, select CloudwaysCDN. Enter your website's URL and click Create. You will then see this page. Just click Apply here. Finally, in your WordPress dashboard, click the CDN tab from the Breeze settings page. Activate the CDN by checking “Enable”. Click save changes and you are good to go! Magazine-style website layouts are trending these days. This trend largely attributes to the fact that various magazines and news websites are publishing content online. MH Magazine lite is a simple and intuitive layout that allows users to publish stories related to different topics in a clean manner. Bloggers, fashion magazines and news websites can also upgrade to the professional version of MH Magazine. The premium theme comes with additional features and options for your website. Along with a light, responsive theme, fast WordPress hosting is also critically important. Hosting your WordPress website on Cloudways can speed up your website. We decided to try out their managed hosting platform with one of our themes and the results were great! Cloudways, with the Breeze plugin, can significantly enhance the performance of your website. What's more, their Content Delivery Network (CDN) is particularly useful if you have a global audience. Let us know what you think about this Cloudways review in the comments’ section below. Disclosure: This Cloudways review has been sponsored by Cloudways. It contains affiliate links to 3rd party products or services. If you purchase these products or services, we may receive a commission from the product or service provider.